HURRY to oppose ISA expansion! As local activists know, the Fairfax County Board of Supervisors will vote on expansion of the Islamic Saudi Academy at its Monday, August 3 on 3:00 PM. Keeping in mind that political officials often respond better to phone calls than letters, I called the offices of Linda Q. Smith, Supervisor, Providence District, and Sharon Bulova, Chair of the Fairfax County Board of Supervisors. Not surprisingly, Smith and Bulova were in meetings. Smith's staff member asked if I supported or opposed expansion of the Islamic Saudi Academy, as Smith's office was keeping a tally. She took down my phone number and said that she would have Supervisor Smith to call me. 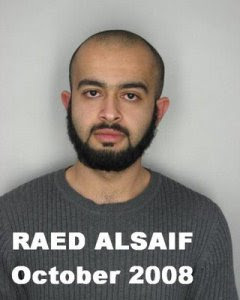 * The possibility that 2003 ISA grad Raed Abdul-Rahman Alsaif was attempting a 9/11-style coordinated attack. * With respect to the concerns of Springfield District residents about traffic safety on Pope's Head Road, I pointed out the 2005 accident caused by ISA bus driver Abdelrazeg Abdalla. No oral statements will be taken at the August 3 meeting; however, written statements, submitted for the record, will be allowed. Supervisor Pat Herrity of Springfield District will make the motion on expansion of the ISA. Please email or fax a written statement for the record to Nancy Vehrs, Clerk to the Board of Supervisors. Email: ClerktotheBOS@fairfaxcounty.gov; Fax 703-324-3926. Reference case number SE 2008-SP-025. HURRY! Written statements must be submitted by COB Friday, July 31, 2009. 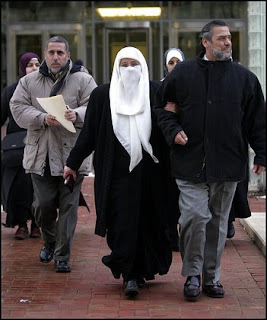 You are urged to read Urgent Action Alert: Help Defeat Terror School in Virginia from ACT! for America: Northern Virginia/Washington, DC Metro Chapter's Official Blog and ACTION ALERT - AUGUST 3, 3:00 PM from Saudi Watch for more information. From IndyStar.com: The ACLU has filed a lawsuit challenging limits on group prayer on behalf of Randall Todd “Ismail” Royer, whom we’ve discussed on Northern Virginiastan, and another inmate, Enaam Arnaout. Both Royer and Arnaout are inmates at the Federal prison in Terre Haute, Indiana. They are being held in the Communications Management Unit (CMU), which seeks to monitor inmates’ outside contacts. Thirty of 40 inmates – that’s right, 75% - in the CMU are Muslims. Randall Todd “Ismail” Royer has had contact with blogger Umar Lee since incarceration. The Federal government has it right this time: there is a “compelling need” to restrict religious activities, in this case, group prayer, as it would be a means of the prisoners to conspire among themselves. Royer, a former communications specialist for CAIR, was part of the Virginia paintball gang. The mainstream media (MSM) portrayed the Virginia paintball gang as just a bunch of guys engaged in fun and games. The truth is more damning. Counts 2-5 of the indictment against Royer and his comrades state that Royer and others had commenced an expedition against a friendly nation, namely India. Some Americans might consider these charges to be dubious: how do these charges impact the U.S.? Royer was recruiting for the Lashkar-e-Taiba (LeT) terrorist group. LeT was behind the brazen terrorist attack last November in Mumbai, India, in which Americans were targeted and murdered. UPDATE: Anti-terrorism activist Debra Burlingame, sister of pilot Charles F. “Chic” Burlingame III, whose jet was crashed into the Pentagon on 9/11, has an opinion piece in the Wall Street Journal about conducting jihad from prison (hat tip: Atlas Shrugs). While Ms. Burlingame's article focuses on the lifting of security measures imposed on Richard Reid, the notorious "Shoe Bomber," she cites the case of Royer and Enaam Arnaout towards the end of the article. Our favorite splindly terrorist wannabe and 1999 ISA valedictorian Ahmad Omar Abu Ali was re-sentenced today. He will now carry a life sentence, not the original thirty years. 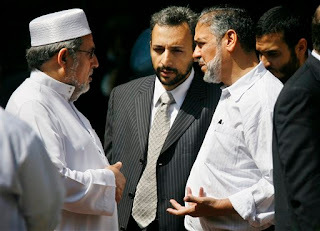 The usual suspects (L to R): 9/11 Mosque iman Shaker Elsayed, lawyer Ashraf Nubani, and Abu Ali's dad, after the re-sentencing. The three men have been previously covered by Northern Virginiastan. "I would like to remind you that you too will appear before the divine tribunal with me and everyone else," he said in a brief statement to U.S. District Judge Gerald Bruce Lee. "That day there will be no lawyers ... If you are comfortable with that, you can decree what you will." Northern Virginiastan not only has a Digg widget on the right sidebar, but we also have a Digg feed! I'm glad that Marooned in Marin made me aware of his/her blog. 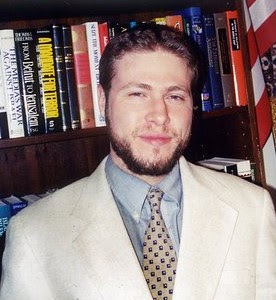 Marooned in Marin found another story about legal jihad (see our story about Randall Todd "Ismail" Royer), this time featuring 1999 ISA valedictorian and everyone's favorite spindly terrorist wannabe Ahmed Omar Abu Ali. The source for the story was the Wall Street Journal Law Blog. Abu Ali went on hunger strike because prison authorities wouldn't let him read "Dreams from My Father" and "The Audacity of Hope" by Barack Hussain Obama (NMP). Prison authorities later recanted. I'd cover my face if he were my son. "I was there and share many of your observations. I took video inside and outside the meeting as well." You may find the video at Marooned In Marin: Public Hearing On Islamic Saudi Academy To Fairfax Board of Commissioners: Will Board Turn A Blind Eye To The Concerns Of Constituents? Did ISA grad plan to execute 9/11-style attack? ... two other individuals, Roshid Milledge and Damien Young, were arrested in Philadelphia after sneaking a handgun onto a flight. The airline? U.S. Airways. The destination? Phoenix. The departing time? About 35 minutes from the flight Alsaif attempted to board, using the same airliner and with the same destination. While the FBI initially denied any connection between the events, it later retracted and said that they were looking into connections. But then, this is the same FBI that collaborated with CAIR for outreach to the Muslim community. The FBI broke ties with CAIR, only to replace CAIR with the equally suspect Islamic Society of North America (ISNA). ACT! for America Northern Virginia/DC Metro area thanks ISA opponents for their support at the July 13 Fairfax County Board of Supervisors hearing It also features a transrcipt of the anti-American diatribe by Dr. Mabu Mohammed, a physician who has lived in the U.S. for 43 years. Disgusting. Why does this man remain in the U.S.? Contrast that to our Egyptian apostate: as we were walking to our cars, we said that this man is a true patriot. Here is a man who was a student of Sheikh Omar Abdel-Rahman, the blind cleric who masterminded the 1993 attack on the WTC, at Al-Azhar University, where BTW Barack Obama (NMP) spoke. Because he dared to ask questions, he had to flee for his life. America welcomes you, sir! This is not comprehensive coverage of last night’s Fairfax County of Supervisors hearing on expansion of the Islamic Saudi Academy (ISA). It is simply my strongest impressions from the meeting. While I had concerns about coordination among opponents of the ISA, opponents greatly outnumbered supporters. Some opponents were not ideologically based: residents who live near the school complained about increased traffic and being downstream from septic fields. A petition to oppose the ISA based on land use was signed by 300 residents living near the ISA. While a person representing an opponent who couldn’t make it because he was sick was not permitted to read a statement, one Christina Sheetz, an ISA alumna, was allowed to make a statement on behalf of Kamal Suliman. I called my district supervisor’s office about this double standard, and I was referred to Sharon Bulova’s office. Ms. Bulova rebuked ISA opponents twice for clapping, while supporters were not rebuked. Reem Al-Hussain, a 2007 ISA alumna and now a student at GMU, said that equating one person (she was probably alluding to Abu Ali) with the whole of Islam was like equating Hitler with the whole of Christianity. Despite her over-the-top statement, I actually cut her some slack because of her relative youth. However, her statement that she felt that she was “stabbed” is symptomatic of Muslim victimology. Dana Nicholas, who identified herself as an assistant principal at ISA, testified that ISA bus drivers would be educated in traffic safety and that ISA bus drivers had an excellent safety record. She is lying. Refer to our 2005 article WaPo conflates two bus accidents. One opponent said that if the government didn’t serve the citizens, then overthrow the government. He dramatically turned to the audience when he shouted “overthrow the government.” He was subsequently rebuked by Katherine Cox Chenard, who identified herself as a teacher and curriculum development specialist at ISA. I distance myself from his statement. It hurts the cause. Instead, I would have coldly told the Board of Supervisors that if they support ISA expansion (as sadly, I expect they will), then we will remember that at election time and vote them out. Several ISA parents testified what a safe environment ISA provided: drug-free, fight-free, alcohol-free, teen pregnancy-free, yada yada yada. How are ISA students punished for transgressions? Did anyone else catch the irony of advocating a private school before the county government, which has oversight of Fairfax County Public Schools? Fairfax County Public Schools are obliged to serve all school-age children, whereas a private school can select its students. Moreover, what is being done to assure that Fairfax County Public Schools are drug-free, fight-free, alcohol-free, and teen pregnancy-free? Finally, visit the comprehensive video coverage provided by Atlas Shrugs, especially the testimony of an Egyptian apostate who was not on the advance speakers list. UPDATE: Snapped Shot couldn't attend last night's hearing. He notes that the final decision on the expansion of ISA has been deferred to August 3. Also refer to his links to Crystal Clear Conservative's report and live tweets. I've set up an account on Digg to share stories about creeping Islamicism in the DC Metro Area and set up a Digg widget to feature the most recent stories on the sidebar to the right. Get there early to get a seat. ISA will pack the chambers with its supporters. Call Sharon Bulova, Chair, and your District Supervisor, to vote "No" on expansion of the ISA. To find your district supervisor, go to the application My Neighborhood, http://www.fairfaxcounty.gov/gisapps/myneighborhood/myndefault.aspx?fxmResolution=1024x768, select "General Information" and enter your street address. 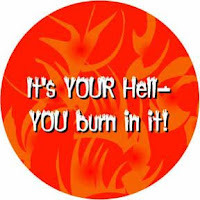 Tell them that you, as a resident of Fairfax County, oppose expansion of the ISA. I read that U.S. representatives are more influenced by phone calls than letters. It might work the same way with the Fairfax County Board of Supervisors. You might want to follow up with a fax or e-mail of the flyer issued by the newly formed Virginia Anti-Shariah Task Force. I also suggest copying Robert Spencer's Why we fight on this Independence Day and formatting it on 8-1/2" x 11" paper to include in your email or fax. NOTE Sharon Bulova appeared at the kick-off meeting for Esam Omeish's failed bid for Democratic candidate for the 35th District Virginia House of Delegates. In that way, she's a worthy successor to former Chair and now U.S. Representative Gerry Connolly. * Share the flyer with others. I'm going to post it on my church bulletion board, even though one of our members was instrumental in getting the ISA established in Fairfax County.